How To Use Clove Essential Oil To Treat Toothache | 3 Top Ways ! Applying clove essential oil also called as lavang oil in Hindi is one of the most popular remedies for tooth pain. Cloves are actually the flower buds of a tree whose botanical name is Syzygium Aromaticum. Cloves are native to Indonesia but now it is grown in many countries including India. I have always wanted to grow clove tree in our farm and I even planted one few months back. But due to the severe drought we are facing now, it just died last week which really upset me. Clove is one spice that I always stock in my pantry as I use it always to season the curries and rice. Now lately I stock up clove essential oil too to use in remedies as it has wonderful medicinal properties. For treating toothache, I use clove essential oil as such or use it along with pounded cloves for making mouth wash.
Clove based mouth washes are not only effective for treating toothache, it also treats tooth decay, tooth cavity, gum diseases, gum pain and tooth infection. Eugenol is the main bio active compound of clove that is found in very high concentrations, almost 89% of clove essential oil contains eugenol. Three types of essential oils are distilled from clove tree – clove bud essential oil, clove leaf oil and clove stem oil. Out of these three, clove bud essential oil is the most widely used and I would suggest using it for toothache. The reason clove essential oil is wonderful for treating tooth pain is because it has powerful analgesic, antimicrobial and anti inflammatory properties. It not only helps reduce the pain and inflammation, it also helps treat the infection very effectively. Another interesting fact about clove oil is it is a very effective anesthetic. It is so effective that it can effectively replace the traditional gel benzocaine used for reducing the pain before needle insertion or tooth extraction. You can read the study that proves it here. Eugenol present in clove essential oil should not be ingested in large doses, it can be rapidly absorbed and enter our blood stream. Eugenol is prooxidant in large doses! If we use clove essential oil repeatedly often in large doses, it can cause intense irritation and some times can lead to tissue burns too. Try not to swallow clove essential oil and make sure to use just a tiny drop of clove oil on the affected teeth. Pregnant women should not use this remedy. 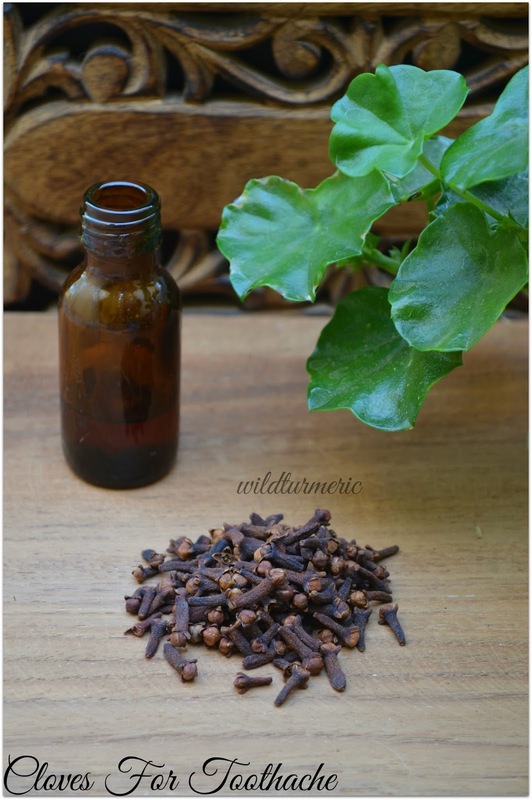 Where to buy clove essential oil for treating toothache? 1. 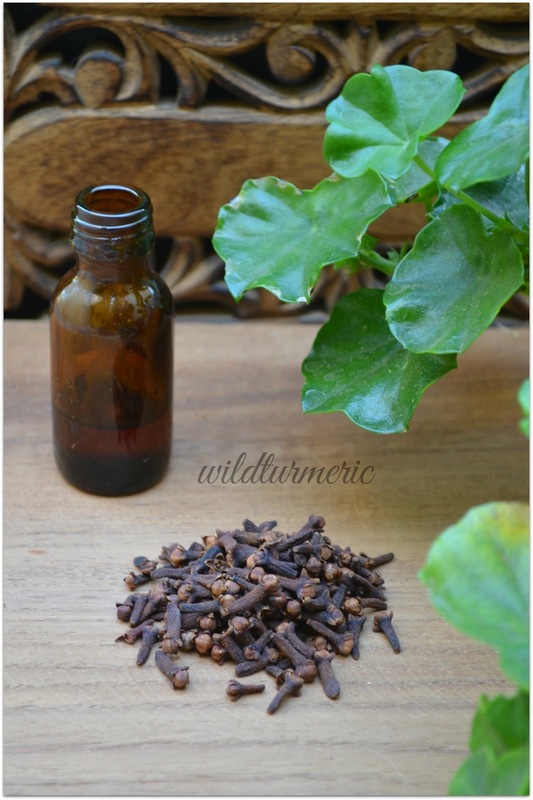 How To Make Clove Oil For Toothache? 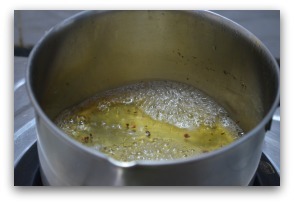 You can make your own clove oil at home by pounding 3 small cloves to fine pieces and then adding it to 1 tbsp of coconut oil or olive oil and heating it under sunlight. Once warmed up, strain to get clove oil. Dip a piece of cotton in this oil and use it as a compress on the affected teeth but it is not as effective as clove essential oil. Clove essential oil is really wonderful in bringing the inflammation and pain. 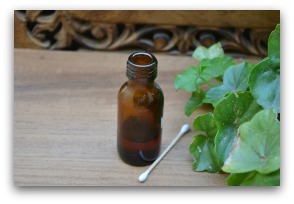 To use, just take tiny bit of clove essential oil using a earbud and place it on the affected area. Use only a tiny drop, just enough to wet the earbud. After applying wait for 10 to 15 minutes before rinsing your mouth. You can also mix 3 drops of clove essential oil in 1 tbsp coconut oil, dip a cotton and use it as a compress on the affected tooth too. 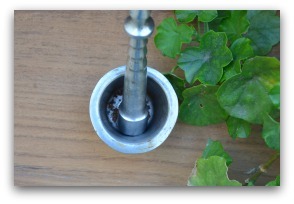 Pound 2 cloves in a mortar and pestle to break them and then boil them in a cup of water till the water changes color and reduces a little. Add 2 drops of clove essential oil and mix well. Strain and use the water as a gargle for treating toothache and gum related problems.